I’ve been in some so called “murder capitals of the world”, hell I’ve even worked in one, Belfast (and played football in North Belfast which sadly once held the unwanted honour of highest murder rate in Europe). Forgive my Northern Irish blood here but how dangerous can San Pedro Sula in Honduras be? Quite a lot as it turns out. This place lives up to the reputation that precedes it. That aside, I took my backpack here while touring Honduras. Arrival back into Honduras at Puerto Cortes. So after getting the boat from Placencia in Belize back into Honduras at Puerto Cortes, I had told Panny I wanted a night or two in San Pedro Sula as it’s a hub. I knew that once we got there we could relax and make up our mind on where to go next. The bus station in San Pedro Sula has direct buses to Copan, La Ceiba, Tegucigalpa and Lago de Yojoa. So it seemed like the place to stay to work out our plans. After getting our passport stamped at the port town entry of Puerto Cortes, we had spoken to some taxi drivers at the border. But they wanted too much money and simply wouldn’t budge. 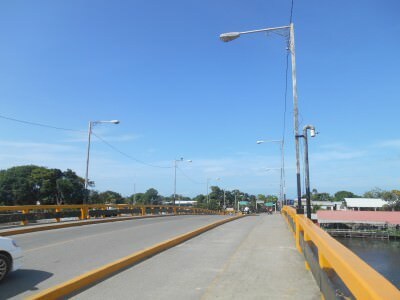 The bridge to the bus ‘station’ in Puerto Cortes. 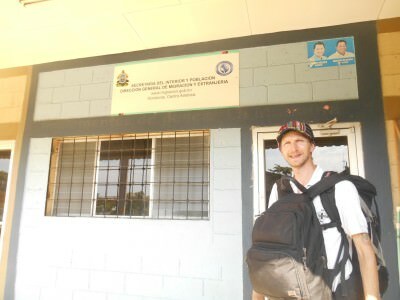 So we decided to backpack it alone to San Pedro Sula. 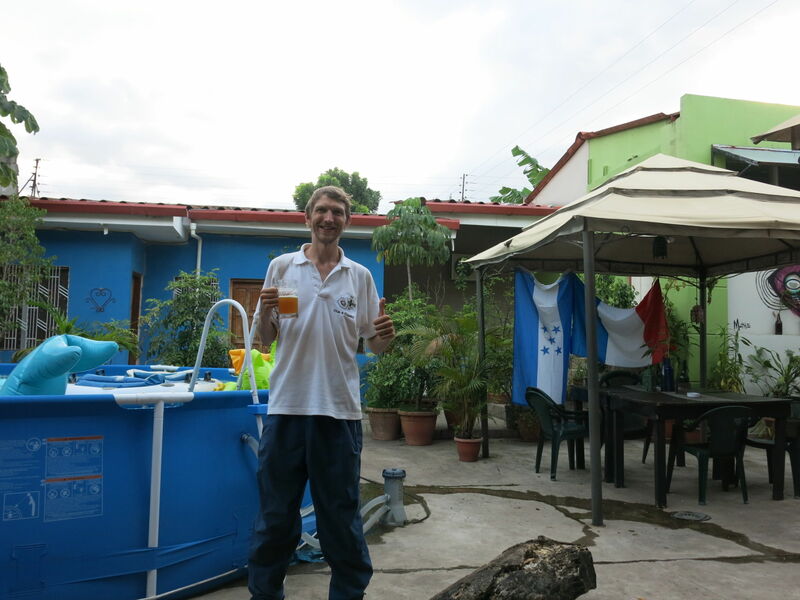 I know that some people think this is not advised, but as I saw it – get a bus from Puerto Cortes to San Pedro Sula and then get a taxi straight to the hostel we chose (in the end we went for La Hamaca Hostel which was completely over priced but had beer on tap and was safe.) So from Puerto Cortes, you leave the immigration terminal and turn right – then you see a road up onto the bridge. 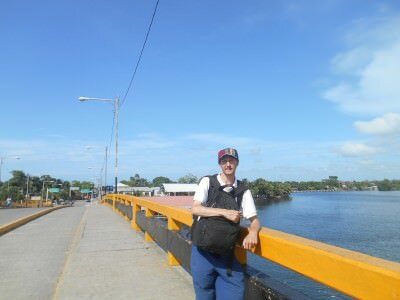 We walked across the bridge in Puerto Cortes and asked where the bus station was. 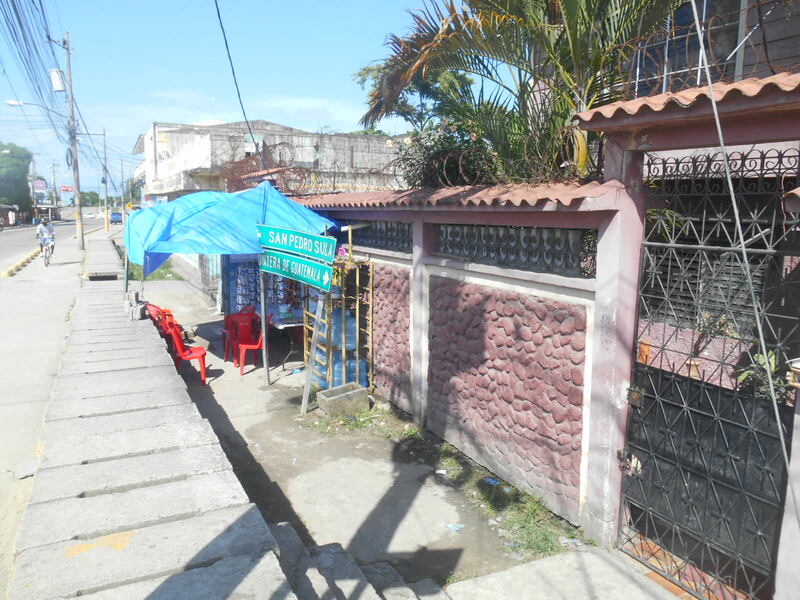 It’s not actually a bus station – just a small bus stop. Again while we arrived there some over priced taxi idiots tried to get us to pay for a taxi. No chance. 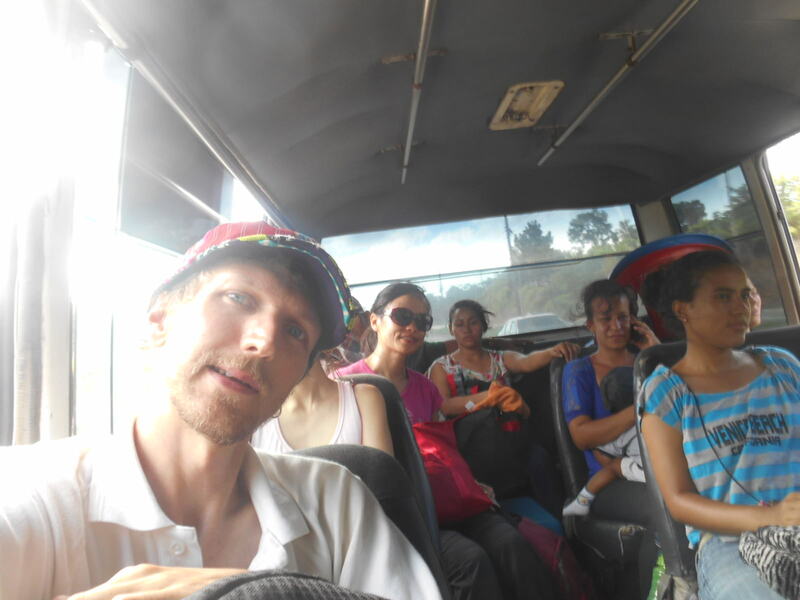 Within 30 seconds a minibus packed with locals arrives and it’s heading for San Pedro Sula, so we dive on. It gets busier and it has many stops on the way. People get on and off – not another tourist in sight and a few potentially shady characters. The minibus to the danger zone. There are a lot of females at the back of the bus next to Panny and they talk to her. One of them, called Heydi tells us she has a car and will drive us to our hostel. This immediately sounds like a perfect plan as it does seem more sketchy than other bus rides or cities. We read, and were told that often gangs hop on buses with guns to rob the driver and passengers. And with all our luggage on us, we now had a safe route. 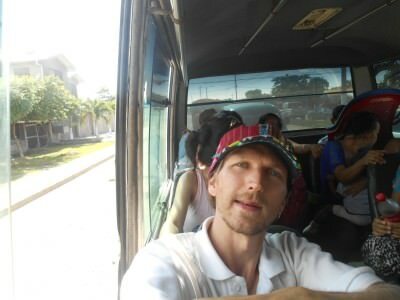 On the minibus to San pedro Sula. As we got to San Pedro Sula, the bus got so rammed full of passengers and some unsavoury characters got on board. One guy was acting like some kind of US gangster! 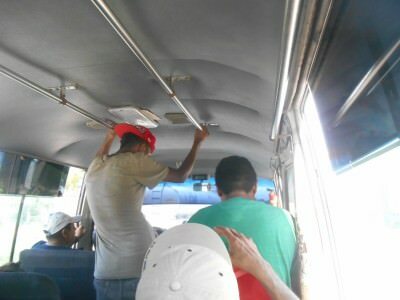 The minibus to San Pedro Sula before it got rammed. The traffic in San Pedro Sula is pretty hectic on arrival and the bus is now over crowded. Heydi then signals to Panny and I to try and get off and it’s a major squeeze to get out but we manage it. The corner where we get out. We get off and the minibus leaves and we are in a sure fire dodgy area!! Within seconds of getting off, our friend Heydi is approached by a guy who wants money. She gives him a bit to get rid of him while we stand as the most obvious tourists of all time. It’s not yet dark though and Heydi calls her brother, Omar. 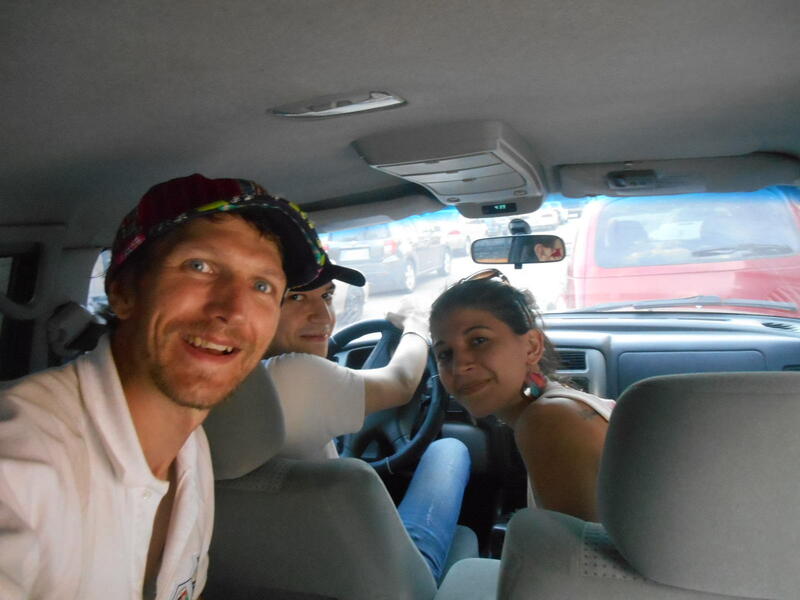 He comes within minutes and picks us up, huge relief and a typical welcome and this is a safer area than most, Heydi tells us…we put our bags in Omar’s car and hop in. Heydi then asks where the hostel is, so we pick the Hostel Hamaca and they offer to drive us straight to the door. This is so kind of them. On the way we pass one of two football stadiums, I later find out this is the minor stadium, the second biggest one in the city. 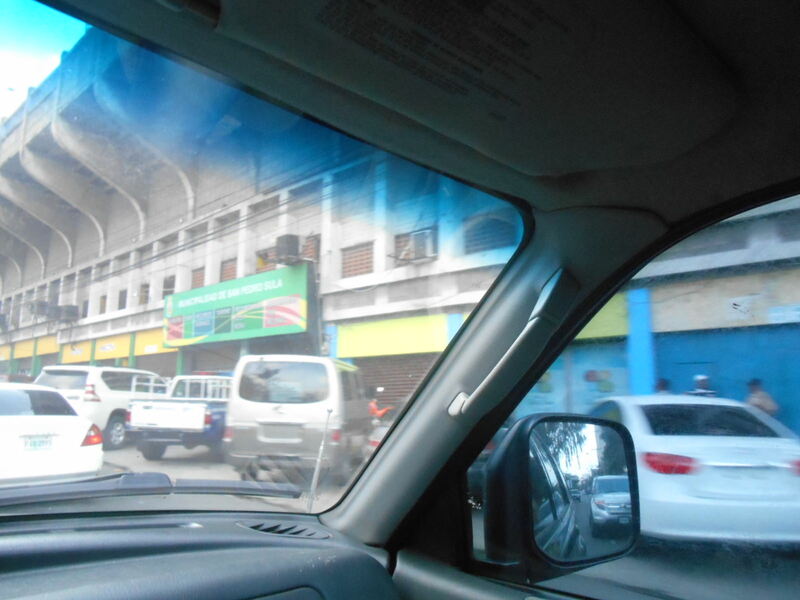 Football stadium on route to our hostel. I grabbed a photo with Heydi and Omar as it was actually a relief to have made it to the hostel on a very busy day where we woke up early to leave Placencia in Belize, spent 5 hours on a boat, walked in the heat, got a crammed minibus and a friendly local taxi in the murder capital of the world. 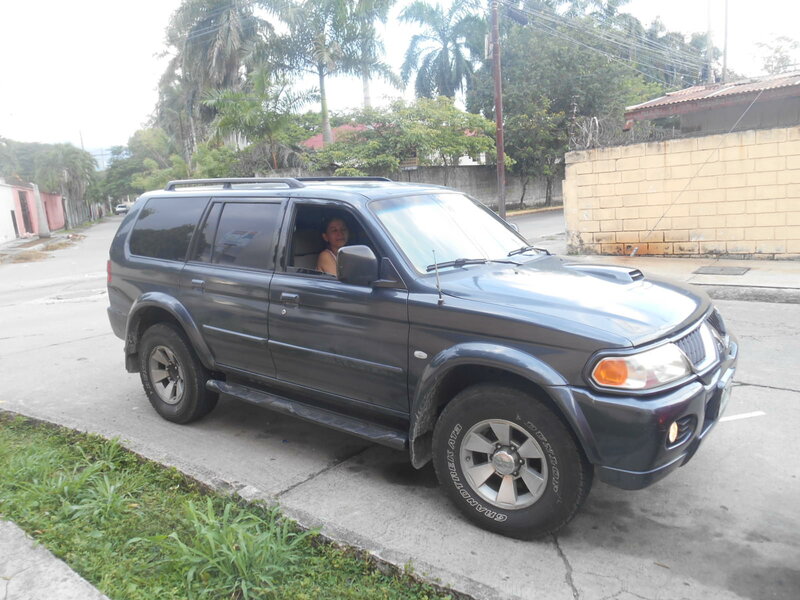 Relief on arrival in San Pedro Sula at our hostel – with Omar and Heydi. Thanks guys! Safe and sound and ready to explore, we were now in San Pedro Sula. 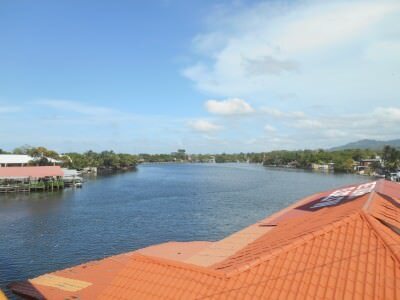 We ended up staying two nights and you can read my top backpacking sights in San pedro Sula on that post. After checking into Hostel La Hamaca, I got a beer on tap, got online and blogged. Bliss in the murder capital – beer on tap from D and D brewery. Then I chilled out in the beer garden with a pizza and beer and all was well. It had been a decent adventure…and yes, we were now SAFELY in the most DANGEROUS city in the world. 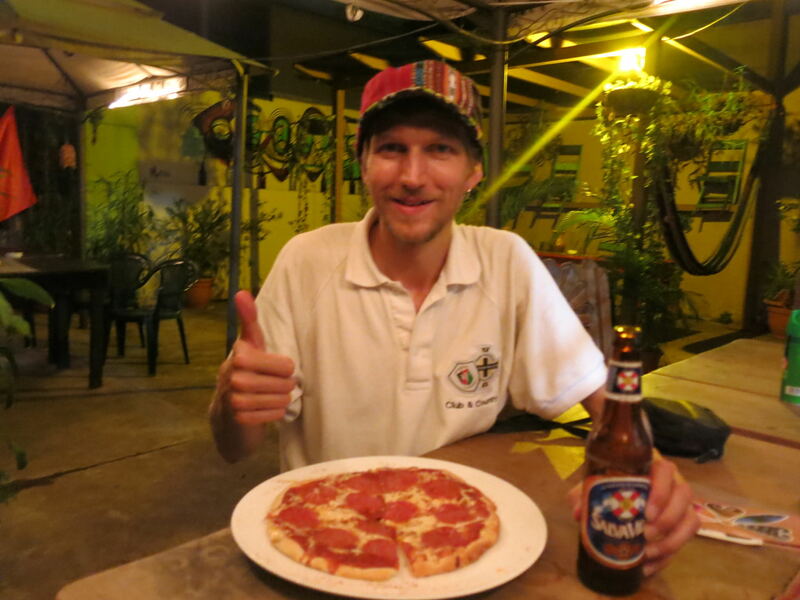 Pizza and Beer – YES all is well in SPS. 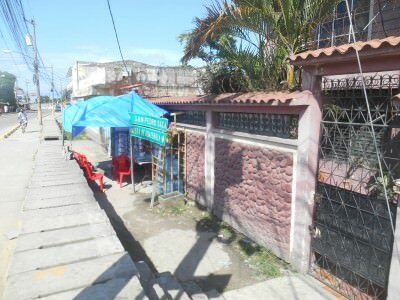 This entry was posted in Honduras, North America, San Pedro Sula. Bookmark the permalink. 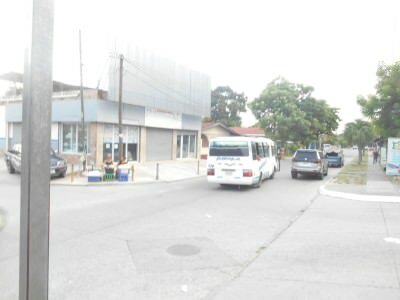 When you say gang members tend to hop on buses to rob the drivers and passengers, I am assuming that is mainly with inter-city buses within San Pedro Sula? But, if you take a 1st class coach bus either to or from other parts Honduras (Tegucigalpa, Copan San Ruinas, Le Ceiba, etc. ), like Hedman Alas, you should be fine? I have never heard that they have assaulted executives buses, and the public transportation it has been assaulted which is occasionally but it all depends on which route and area your planing to go, the danger in the city is in marginal areas that are not usually visit, only if you live there and there are no hotels or tourist centers. I Only can say it is not safe to walk lonely streets , or showing things of value, like a watch , cell phone, sunglasses.